The extremely popular puzzle game is back, and this time better than ever! Click here to play! There's no need to fret about time limits and high scores, because this Bejeweled slot machine is as simple as they come. 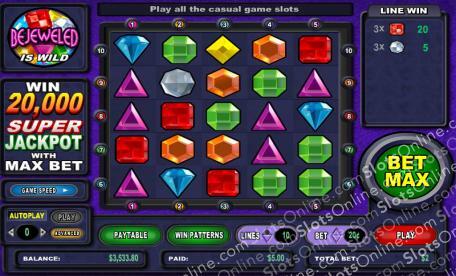 Bejeweled is a unique slot machine that is played across 10 pay lines. There are no reels, perse; however, the game has a 5-reel feel to it with each round allowing 25 jewels to drop into the pay lines. When a combination has been made, those jewels will automatically pay out and then disappear, allowing new jewels to drop down without having to spend money on another round. The Bejeweled symbol is Wild and can be substituted for any other symbol on the reels, and if you manage to spin up five of them on lines 1 to 9 you will receive 1,000 times your wager. However, if you get all five Bejeweleds on line 10 you will win 20,000 times your initial stake! Join in on the excitement of Bejeweled today, and walk away with a treasure chest worth of winnings. The Bejeweled symbol is Wild and can be substituted for any other jewel in the game. When 5 appear on lines 1 to 9 the payout is 1,000:1, and when they appear on reel 10 the payout is 20,000:1. Cryptologic slots give you the option of any number of auto play spins up to and including 999. It provides a delay between each spin between 0.25 and 2 seconds, giving you time to see exactly how much money you win each spin.